Continuing sports success for Robyn McAlpine S1Cr. 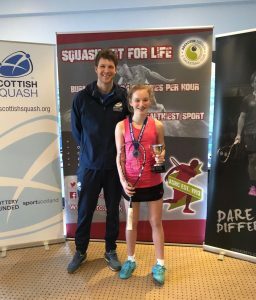 Robyn took part in the Scottish Squash National Championships in Aberdeen over 1st-3rd February. After a shaky start and coming to terms with the pressure of being number 1 seed, she went on to win the Girls under 13 category after 3 days of competition!